Its name comes from the botanist Bougainville. Climbing thorny plant. Much appreciated for pergolas thanks to its year-round flowering in Mediterranean climates. In zones of Mediterranean climate the tree can be placed outside during the whole year. In colder zones you have to protect it against frost. Abundant in summer and in moderation the rest of the year. Take care of the quality of water as the leaves of this tree have a tendency to yellow if it contains too much chlorine. Every 2 years, at the beginning of spring. 100% Akadama, or a mixture of Akadama with 20% of volcanic earth or with 20% of Kanuma. When branches have 6 to 8 leaves cut off leaving 2 leaves. Eliminate vine shoots which are too strong. 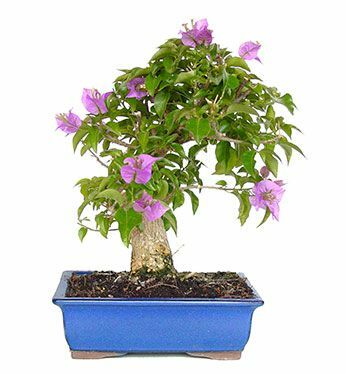 The bougainvillea’s pink, purple and violet flowers are only three sepals which protect in its interior the veritable flowers, which are small, yellow, tubular and grouped inside of a wrapping. This website uses the cookie _ga owned by Google Analytics, persistent for 2 years, to enable the control function of unique visits in order to facilitate your navigation through the website.